While lots of books focus on teaching children to count, the best ones disguise the lessons among eye-catching illustrations and a memorable story. The Noisy Counting Book by Susan Schade and Jon Buller does both. The front cover shows a friendly boy carrying his fishing gear next to the lake. In the middle of the water sits a frog saying “ga-dunk!”. The frog’s sound is my only complaint about the book. Including the cover, “ga-dunk!” appears nine times in the 24 pages of the book. Every time I read “ga-dunk!” I wondered why the frog sound wasn’t some version of “ribbit”. I’m not sure where “ga-dunk!” came from, but it has absolutely nothing to do with a frog. 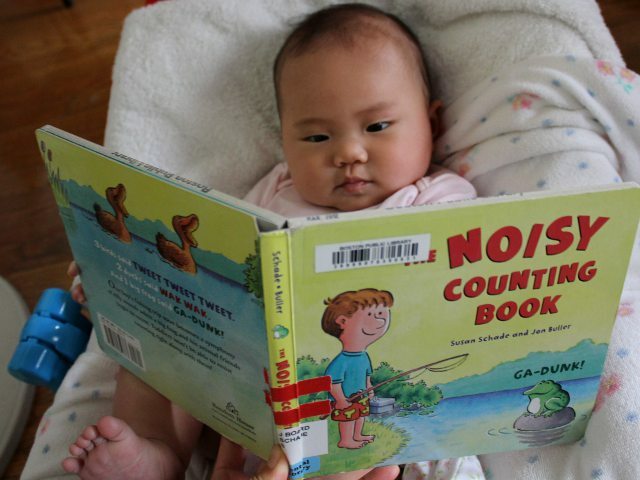 The Noisy Counting Book relies on strange animals sounds. Other than the frog and his annoying “ga-dunk!”, are the ducks who “wak wak”, birds who “tweet tweet tweet”, fishes who “blub” “blub” “blub” “blub”, crickets who “chirp, chirp, chirp, chirp, chirp”, and mosquitoes who “bzzz” “bzzz” “bzzz” “bzzz” “bzzz” “bzzz”. The quantity of each type of animal matches the number of animal sounds. So with the physical number of animals and the frequency of the animal sounds, the book encourages young children to learn to count from one to six. Throughout the majority of the book, colored numbers also aid in counting. The last few pages are dedicated to a (at least for children) funny sequence. Although good for teaching counting from one to six, The Noisy Counting Book has narrow appeal. Arya was uninterested in the pictures because no individual detail was large enough to hold her interest. While there are colorful animals throughout the story, huge segments of each image are painted nature backgrounds of little interest to babies. Children old enough to count beyond six may enjoy some of the funny animal sounds, but with no plot and a nonsensical story, there isn’t enough meat to sustain an older child for many repeated readings. Between ages one and two, The Noisy Counting Book would be an ideal way to introduce the concept of counting quantities. Arya stared at me trying to make the ridiculous animal sounds. One or two-year old children will similarly enjoy adult attempts to sound like the animals. Parents should be aware of the requirement to make silly animal sounds over-and-over again before considering the book for its lessons on counting. The Noisy Counting Book costs (including shipping) $7.99 new and $3.99 used from Amazon.